- "The criticism came a day after House Foreign Affairs Committee Chairman Tom Lantos told reporters in San Francisco he has been trying for 10 years to obtain a visa to visit with leaders in Tehran. "Speaking for myself, I'm ready to go," said Lantos (D-Calif.). "And knowing the speaker, I think she might be." I wish papers would constantly stop referring to Congressman Lantos as a Holocaust survivor. It smacks of clumsy reporting at best and of exploitation at worst. In reading a dozen articles about Lantos, this is constantly brought up where it has no relevance. Congressman Lantos being willing to meet with a genocidal madman tells us nothing about the importance of dialogue, it tells us about Lantos' own personal priorities. The logic of those priorities is inexplicable, but that's an explanation he owes to the voters who elected him. He represents his particular district in California, not the Jewish people or Holocaust survivors. For him to allow a status as a Holocaust survivor to be made use of in this way is grossly inappropriate. Congressman Lantos' own experiences in the Holocaust clearly did not dispose him toward raising Jewish children in a Jewish family. They did not dispose him to resist empowering Ahmadinejad in the manner he is attempting to do. Instead he is doing his best to give that madman a perfect propaganda photo opportunity. Even as he's also giving the murderous Putin regime a massive present by lobbying for the removal of the Jackson-Vanik amendment. - Caroline Glick has an excellent article demonstrating the flaws of the process of promoting Democracy in the Arab world, that allowed those Islamist groups with better organization and force to seize the advantage. "Rather than promote liberty, which at its core revolves around a certain foundational understanding of human dignity, the administration promoted elections - fast elections - in Iraq and throughout the region. In so doing, the administration placed the cart before the horse, with predictable results. The legacy of tyranny is hatred and dependence. And the values of hatred and dependence were those that were expressed at the ballot boxes in Iraq, Egypt and the Palestinian Authority. In all jihadists, often allied with Iran, were empowered while those that were considered moderates modified their positions in opposition to the US. These forces, who receive no money from Iran and Saudi Arabia to buy votes, and have no private militias to intimidate voters, couldn't compete against the likes of the Dawa party in Iraq, the Muslim Brotherhood in Egypt or Fatah and Hamas in the Palestinian Authority. By pushing fast elections, the US entrapped itself. It inadvertently empowered its enemies and so was unable to embrace the duly elected governments. In opposing the forces it expended so much energy getting elected, the US was perceived as weak, foolish and hypocritical." 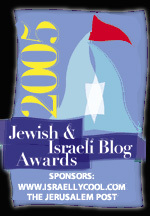 - I've been award a Thinking Blogger award by Maggie's Notebook. I'd like to mention Maggie herself whose blog combines interesting analysis with current events reporting. Linda whose blog Something and Half of Something which is always worth reading for provocative and daring commentary. The Ignoble Experiment is one of the few personal blogs I read regularly. Right Truth collects information and informed commentary into a great bundle of posts. And of course NeoCon Express which is a daily read for insightful posts on what's going on in the world today. 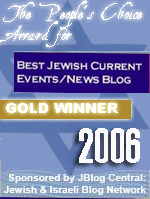 - Excellent http://www.israpundit.com/2006/#">article and commentary at IsraPundit on the cost of being prepared to make any concession. - Finally a must read post from Linda on the consenquences of freeing terrorists. It's Lantos' fault that the media is lazy and enjoys nothing more than finding convenient labels for public figures? Should he start writing into newspapers and chiding their reporters? I'm thinking that politicians are probably happy when the inane bio-blurb about them is at least marginally accurate. That said, of course there are plenty of issues and stories in which Lantos' status as a survivor has little relevance- but I would point out, first, that this has more to do with the way the media works, and second, that Lantos is far from the only survivor whose past is brought up in situations where it's irrelevant. This is not to say that it's neither clumsy reporting nor potentially exploitative, simply that the issue you identify is part of a much larger one. Congressman Lantos being willing to meet with a genocidal madman tells us nothing about the importance of dialogue, it tells us about Lantos' own personal priorities. For the record, I don't think that there's a particular straight-line train of logic between the importance of dialogue and being a survivor. Yes, I see the connection, but it's not necessarily relevant. He represents his particular district in California, not the Jewish people or Holocaust survivors. So the only people that are appropriate to be identified as survivors are public representatives of Jews or survivors? What about Joe Schmoestein, private citizen and survivor? Does he need a permit or what? And what counts as a Jewish representative? MK? Rabbi? Orthodox rabbi? Brooklyn assemblyman? Where are you drawing your boundaries? Congressman Lantos' own experiences in the Holocaust clearly did not dispose him toward raising Jewish children in a Jewish family. And now THAT'S the barometer of whether you can be identified as a survivor?! Since when? They did not dispose him to resist empowering Ahmadinejad in the manner he is attempting to do. And if they did? His life in Europe wouldn't be relevant either way. Now you're just playing politics. Survivors play "tough Jew", you don't mind them using the label. Survivors like to kibbitz with dictators, you want to take their ID card away and kick them out of the club. What gives? Instead he is doing his best to give that madman a perfect propaganda photo opportunity. So when survivors do thing you don't like, they don't get to be called survivors any more. Good to know. Even as he's also giving the murderous Putin regime a massive present by lobbying for the removal of the Jackson-Vanik amendment. So, if an Israeli survivor hypothetically supported Putin's regime, is his status revoked, too? Or is it different if he's in Israel? What if he represents some Jews? Come on. Either this about relevance vs. irrelevance (with that weird stuff about how survivors should only be named as such if they pass the "Jew rep" test), or it's about you not liking it when survivors make political moves you dislike. You can't complain about Lantos' status being used in situations where it's not topical and THEN say the real problem is that he isn't acting the way a proper survivor should- which apparently means blowing any would-be Jew-hater to hell. The first argument is quasi-decent, if nit-picky and overly totalitarian. The second is, simply put, rather lame. Lantos is hardly a passive actor in this and when Pelosi is standing right next to him and makes a statement of this sort, he's clearly rather responsible for it. Lantos is a politician, he represents a specific political district, not a broader group, whether it's Jews or Holocaust survivors. Or to put it another way, "Jesse Jackson isn't the Emperor of Black People." I find it annoying for the record, when Elie Wiesel does this. But I find it a good deal more annoying when Lantos or any politician blurs the line between the specific constituents he actually represents and trying to represent people by way of an identity. I find it annoying when Lieberman does this too. They are not elected to represent Jews, they are elected to represent a given territory and the people in it. That's the entire concept of our political system. I agree with Lantos most of the time, but I am getting extremely tired of a man who has rejected a Jewish life, Pro-Israel as he may be, going to the well every time he needs to make a public statement. I find it annoying for the record, when Elie Wiesel does this. But I find it a good deal more annoying when Lantos or any politician blurs the line between the specific constituents he actually represents and trying to represent people by way of an identity. In my mind, these two positions are contradictory- either you're opposed to playing the ethnic card as a rule or you're not. Otherwise this is merely a matter of you not seeing Lantos as being the "right" kind of Jew/survivor and therefore don't think he should be allowed to use the label. Or are you just saying that it's especially galling with Lantos? Sultan, I just found your trackback and my mention. Thanks so much for that. Your list looks interesting and I'm looking forward to visiting those I'm not familiar with. Sorry for the delay. I don't know what's going on with trackbacks.